Alien: Covenant’s true heroes are not the xenomorph aliens, but the characters created by Scott and the actors’ performances as the colony just trying to survive the horrific events that have taken over their lives. "In Space, no one can hear you scream". That tagline became famous in 1979 when the film Alien ushered in a new genre of "space horror" that is still alive today. Its father, Ridley Scott, is back again to where he started it all with Alien: Covenant. Alien: Covenant takes place about ten years after the events of its predecessor, Prometheus. The Weyland corporation is looking to start their "building better worlds" initiative and start to colonization other worlds. A ship of married colonists and human embryos have embarked aboard the ship named Covenant to start a new life. However, while in Cryosleep, a solar flare causes an emergency on the ship which throws the crew into disarray and tragedy. Weighing their options about their journey, the crew picks up an unknown radio transmission that brings them to an unknown planet, that on the surface looks like it would be perfect to colonize…until they uncover the deep dark secrets hiding on the planet. As with Prometheus and the original Alien film, Alien Covenant's true story is not the Alien's themselves but the actors in the film and their interactions with each other, their environment, and of course those pesky Xenomorphs. Scott has truly assembled an amazing cast and it definitely affected the quality of the scenes. Their interactions on the ship as well as in moments of crisis show that the cast really bonded and truly embraced their characters during production. Lead actress Katherine Waterston (Fantastic Beast and Where to Find Them) is truly the Sigourney Weaver of this generation. She has the ability to dive into any role she is given and fully embody it. Scott purposely tried to make her the new Ripley character and it shows. Her portrayal harkens back to the amazing performance given by Weaver in 1986 that garnered her an Academy Award nomination. Hopefully, the Academy will do the same this year for Waterson. Michael Fassbender (X: Men - Apocalypse) continues to provide why he is one of Hollywood's leading actors today giving an amazing performance as both David and Walter. He is truly chilling as an android - one of the best ever put on film in my opinion. The rest of the cast including Billy Crudup (Watchmen), Danny McBride (Pineapple Express), Carmen Ejogo (Fantastic Beasts and Where to Find Them), hold their own and give some of their best performances to date. With the original Alien Ridley Scott helped to pioneer a new horror/sci fi genre. One that, to this day, still has footprints of his original 1979 film. He has gone onto become one of the greatest directors of our generation. When it was announced in 2011 that Scott was returning to the franchise he created there were tears of joy from most fans of the series. However, many fans, as well as critics, criticized Scott for deviated too much from the "Alien" formula with Prometheus. It was then decided by the studio that Alien: Covenant would get back on track and return to the type of film everyone was expecting the first time around. The Aliens are vicious and have returned to their familiar shape that the world has come to love. The scenes are dimly lit and have a claustrophobic feel, and one knows that most people will not survive to tell the tale, which harkens back to the experiences audiences remember back in 1979. While it was nice revisiting the original Alien I can't help but wonder what would have been if Scott was allowed free reign and made the true Prometheus squeal he always envisioned before the cries came for a more "true" alien film. 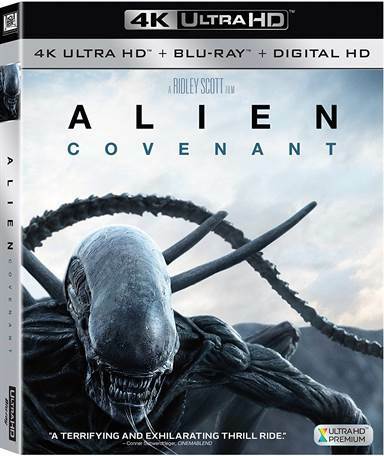 The 4K UHD Alien: Covenant disc is presented in 2.40:1 aspect ratio with a 2160 transfer. While the film was actually shot in a high resolution, it was finished only at a 2K thus making some of the picture's resolution to be digitally upsampled versus being in native resolution. However, saying that, the 4k UHD transfer is still the recommended version of this film as the addition of the HDR color palette adds a new level of detail not seen in the Blu-ray or even the theatrical version of the film giving a new overall tone of "other worldliness" to the transfer. Aside from the video, audio plays a large part in an Alien film, and Alien: Covenant goes all out in this area. The disc's Dolby Atmos soundtrack truly shines in this area. The dialog is relegated to the center channel while leaving the rest of the audio to the other channels. Even creaks of the ship, or sound on the planet, can be heard clearly and distinctly through the speakers. The film uses the full audio dynamic spectrum combined with every speaker to produced one of the best wide-field audio compositions heard in a long time. As the case with most 4k UHD edition, Alien: Covenant's special features are presented on the Blu-ray disc. The extra's are a mixture of marketing material released before the theatrical film was seen in theaters, deleted scenes, an in-depth look at David's laboratory and creations, audio commentary, theatrical trailers, a production gallery, and an hour-long look into the making of Alien: Covenant with Ridley Scott. Alien: Covenant is a mixed bag. While on one hand the story further explores the mythology laid down in Prometheus, it is also bogged down with tropes and "fan service" that was only added after critics of its predecessor film complained. The film's true heroes are not the xenomorph aliens, but the characters created by Scott and the actors' performances as the colony just trying to survive the horrific events that have taken over their lives. It has been said that because of the box-office failure of this film there will be only one more prequel film made, which is a real shame because if the studios just let Scott be free he could deliver the prequel series that he truly envisioned and that his fans have been waiting a lifetime for. Download Alien: Covenant from the iTunes Store in Digial HD. For more information about Alien: Covenant visit the FlickDirect Movie Database.